Episode 2 of the latest Grand Designs series see London couple building a Hollywood Hills style mansion in the heart of the capital. Not really the place you would expect. However to fit their house of their dreams into the small plot of land they bought one floor is to be underground. The logistics of the project see them pushing their neighbours to the limit, by excavating into their land, which see knocking down the walls of their 17 neighbours. It’s fraught with delays and lots of negotiations with everyone individually. The project is scheduled to take a year, but as you know with all projects, they rarely finish on time or even before time. The ambitious project saw the couple adding underground, a swimming pool, gym, nanny flat and a guest bedroom using natural light from above. Their project for a Hollywood Hills style home is set on a budget so that means some things will be sacrifices, the question is what? The sleek and modern bathroom, is high style and high function. Something that wouldn’t be a miss in a celebrity bathroom in Hollywood. Adding the much needed light is an illuminated mirror from Roper Rhodes, with other accents being supplied from Phoenix, Grohe and Crosswater with the fixtures and fittings. You can find these great pieces on our Grand Designs page if you want to recreate this stylish look for your home. Fitting new taps and mixers to your existing bathroom or your kitchen is an easy way to improve the look of this at a very affordable cost in fact you will literally transform it. 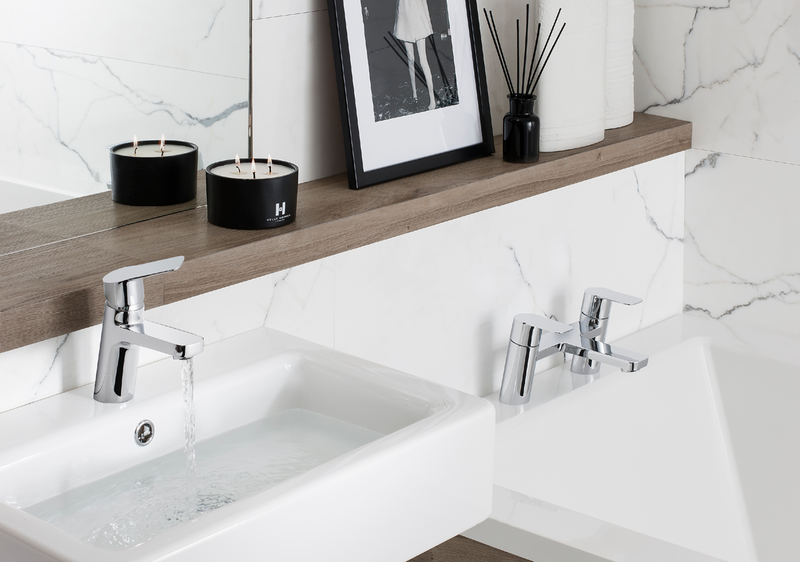 We feel sure that when you have seen the exciting range of taps and mixers that are now available at the comprehensive pages of UK Bathrooms. Modern taps and mixers have progressed from the days of having washers fitted which needed changing frequently, to ceramic disc technology or laser taps as an examples. The Grohe Allure 3 Hole Basin Mixer is just one example of a classy high tech mixer with pop up waste and balanced hot and cold supplies. Finished in high chrome and is currently on a special offer discounted by £175.45.